In studying a book of the Bible some words are significant because they are used so often, such as "all", which was used 30 times in Colossians. Its repeated use draws us into the heart of the message Paul is preaching throughout this book - Christ is all in all. Other words are significant in a book simply because of their theological meaning. This is the case with our word today: Reconcile. The message of reconciliation is at the heart of the gospel. Reconcile is only used twice in the book of Colossians. Both times are in one passage toward the end of chapter 1. We will dig into this passage today to gain a full understanding of the reconciliation Christ brings us. 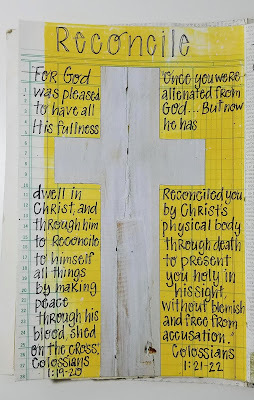 "For God was pleased to have all his fullness dwell in him, and through him to reconcile to himself all things, whether things on earth or things in heaven, by making peace through his blood, shed on the cross. The word reconcile means to bring back a former state of harmony; to change from hostility to peace, especially between persons; to restore to a right relationship. Paul says that it is through Christ that all things are reconciled to God. First, it is through Christ that God chose to reconcile all things to Himself. Jesus Christ is the only way to peace with God. This message is seen throughout the Bible. Jesus himself said, "I am the way and the truth and the life. No one comes to the Father except through me." John 14:6. This message is explained fully earlier in the Gospel of John. "For God so loved the world that he gave his one and only Son, that whoever believes in him shall not perish but have eternal life. For God did not send his Son into the world to condemn the world, but to save the world through him. Whoever believes in him is not condemned, but whoever does not believe stands condemned already because they have not believed in the name of God’s one and only Son." John 3:16-18. Paul states is this way in his letter to Timothy, "For there is one God and one mediator between God and mankind, the man Christ Jesus, who gave himself as a ransom for all people." 1 Timothy 2:5-6. And again in his letter to the Romans, "Therefore, since we have been justified through faith, we have peace with God through our Lord Jesus Christ, through whom we have gained access by faith into this grace in which we now stand." Romans 5:1-2. How does Jesus Christ reconcile all things to God? Paul explains this in the second half of 1:20: By making peace (this is reconciliation) through His blood which was shed on the cross. In Ephesians he states it this way, "But now in Christ Jesus you who once were far away have been brought near by the blood of Christ." Ephesians 2:13. He explains this further in Romans. "But now apart from the law the righteousness of God has been made known, to which the Law and the Prophets testify. This righteousness is given through faith in Jesus Christ to all who believe. There is no difference between Jew and Gentile, for all have sinned and fall short of the glory of God, and all are justified freely by his grace through the redemption that came by Christ Jesus. God presented Christ as a sacrifice of atonement, through the shedding of his blood—to be received by faith." Romans 3:21-25. Jesus Christ became the sacrifice that atoned (pardoned, amended) for our sins. In the Old Testament people had to be made right with God by sacrificing the blood of animals, but now through the blood of Jesus, that God sacrificed, we are made right with God. Why do we need to be reconciled (made right) with God? Paul goes on to explain this in verses 21-22 of our passage. "Once you were alienated from God and were enemies in your minds because of your evil behavior." (1:21). What alienates us or separates us (Ephesians 2:12) from God is sin. God's desire is that we return to a state of harmony, of peace, with Him. In the beginning God created a world that was fully at peace with Him (Genesis 1-2). But then sin entered the garden and Adam and Eve turned away from and hid from God. Because of their sin all of mankind suffered and became alienated from God. Paul again explains how we are reconciled to God in verse 22. "But now he has reconciled you by Christ’s physical body through death to present you holy in his sight, without blemish and free from accusation." (1:22). This once/now contrast serves as a reminder to the Colossians of their position before and after they came to faith in Christ through hearing the gospel message (1:5, 1:13, 1:23). 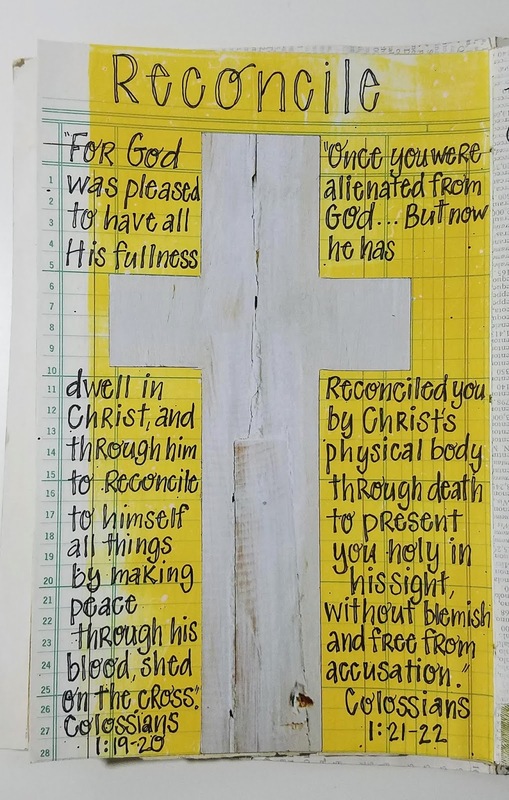 Paul continues in verse 22 to say that God reconciles us through Christ in order to "present you holy in his sight, without blemish and free from accusation". Paul says it like this in 2 Corinthians 5:21, "God made him who had no sin to be sin for us, so that in him we might become the righteousness of God." That we become the righteousness of God means that we are now holy in the presence of God. The message of reconciliation is at the heart of the Gospel - it is the Good News!